Outdoor sling patio chairs have never looked so good. Imagine your clientele sitting back and relaxing in Open Air Lifestyles commercial offering of outdoor sling dining chairs. 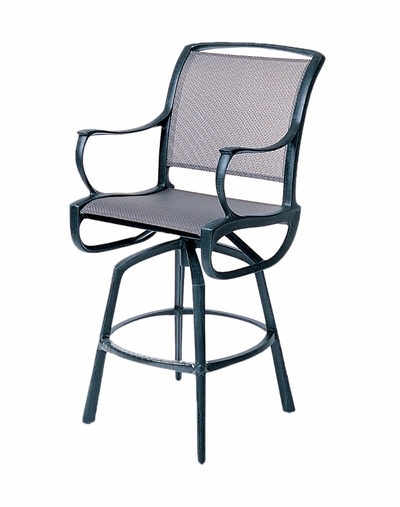 We offer many different styles of aluminum sling dining chairs for commercial use. Quality materials and exceptional customer service guarantee your experience from beginning to end. Every piece of Open Air Lifestyles Commercial Furniture is made to order based on your specs in 4 to 8 weeks. Open Air Lifestyles offers a large variety of frame styles, finishes and over 150 fabrics for a almost endless number of possible selections. Here at Open Air Lifestyles, every piece of our commercial outdoor patio furniture is custom made. For most commercial installations, we manufacture outdoor furniture to your specifications. Quantity restrictions and a focus on frame strength, of course, apply. Contact Open Air Lifestyles or your Commercial Representative for complete details at 1-877-548-5697. Terms: All order must be paid in full before final shipment is made. Large custom orders may be subject to different terms as well 50% deposit to begin production, please contact us at 1-877-548-5697 for these details. Prices: All MSRP prices are as posted on our website. All orders will be quoted in writing to the customer before production with final costs will depend on final raw material spec and quantity that is required. Most custom furniture production will require a minimum order quantity. Freight: Our shipping costs for most items are based on each item's size and weight. We strive to provide you with the lowest shipping cost possible. All orders are shipped FOB Michigan. Unless a specific carrier is requested by the customer, all shipments will be routed at the discretion of Open Air Lifestyles. We may choose to deliver via container direct to certain areas. Customer is responsible for ALL freight charges. Most new orders are shipped between 8-10 weeks. Freight Claims: Any damage to the shipment MUST be noted on the freight bill at the time of delivery. Save all shipping cartons. Claims for freight damages are the responsibility of the consignee and must be filled out with the freight company to collect damages.